July 19, 2018 – An article in The Globe and Mail confirmed a worrying trend: visitor visa refusal rates are soaring. Moreover, visa applicants will soon be required to provide biometrics. Although visitor visas are not required of all visiting artists, those who do will now have to overcome major administrative and financial barrier in order to tour in Canada. Citizens of other countries who want to travel to Canada must satisfy a number of administrative requirements before entering the country. Depending on their country of residence, they may be required to obtain a temporary resident visa (commonly referred to as “visitor visa”), provide biometrics, and obtain an electronic travel authorization. 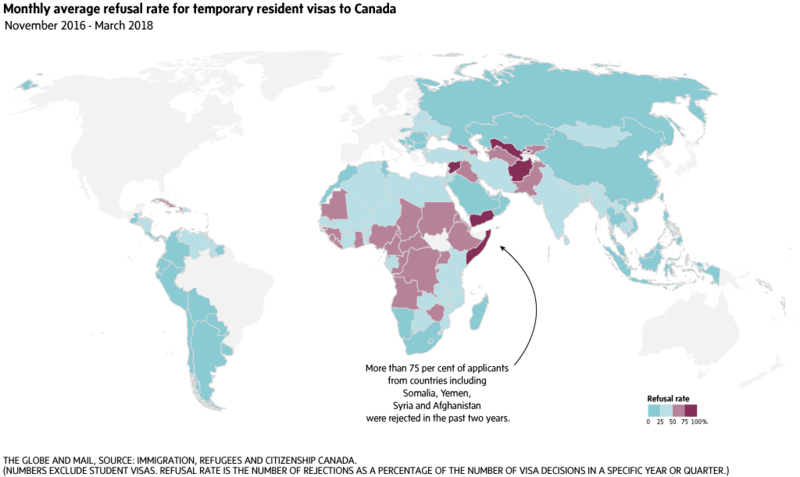 Currently, Canada requests visas for 146 countries. Those countries are mainly in Central and South America, in Africa and in Asia. Although visitor visas have historically not been a significant artist mobility barrier in Canada, thing have changed considerably in the past couple years and are about to get even worst. Applications for temporary resident visas increased from about 1.3 million in 2012 to about 2.3 million in 2017. The refusal rate for temporary resident visa applications increased from 18% in 2012 to 26% in 2017. In 2017 alone, Canada refused entry to nearly 600,000 people. During the first three months of 2018, the refusal rate increased to 30%. The highest refusal rates are clustered in Africa and the Middle East. The refusal rate for student visas has also increased, from 26% in 2012 to 33% in 2017. Image reproduced with authorization by The Globe and Mail. This information is consistent with stories reported by members of the performing arts presenting community. 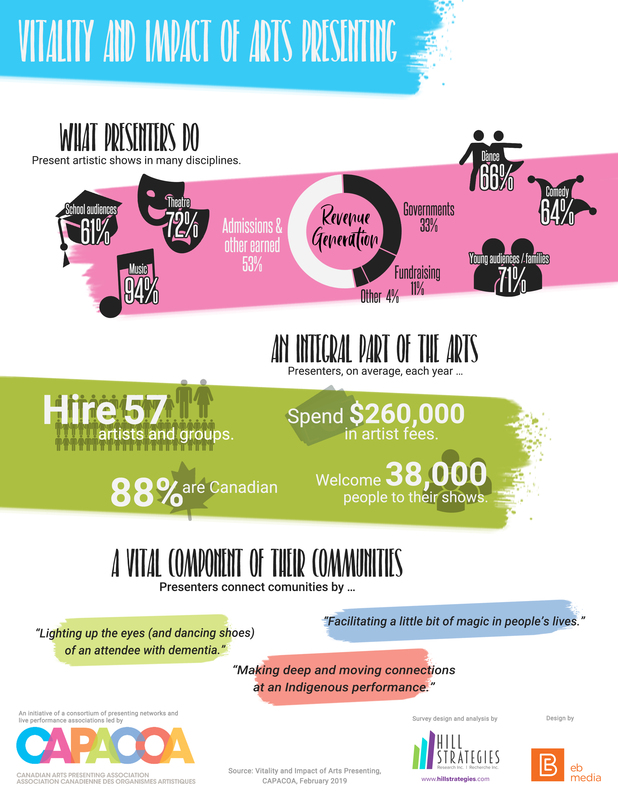 The increase in visa refusal rates represents a serious threat for Canadian performing arts presenters and festivals. Since almost any music group or theatre company touring Canada travels with four or more performers and crew member, the odds that at least one visa applicant will be turned down are becoming extremely high. And the dire consequences will be cancelled performances. The process for securing a temporary resident visa is about to become much more cumbersome and expensive. Starting July 31, 2018, biometrics (photograph and finger prints) will be required from visa applicants from Europe, Middle East and Africa. As of December 31, 2018, the requirement will expand to visa applicants from Asia, Asia Pacific and the Americas. In order to give biometrics, visa applicants will have to go in person in a visa application centre in their country or in a nearby country. In effect, this means applicants will no longer have the option to have their visa application processed over the mail. For some visa applicants, this will imply significant travel time and travel costs. The requirement for biometrics also comes in with a processing fee. The processing fee for an individual applicant is CAD$85. Groups of 3 or more performing artists and their staff who apply for work permits at the same time will be subject to a maximum total fee of CAD$255. This mitigation measure will however have a limited impact. Indeed, performing artist who enter Canada for a tour (and are not taking on work as part of a Canadian production) are work permit exempt, as per Regulation 186(g). They will therefore not be able to benefit from the maximum fee for performing artists. For any music group or performing arts company, the costs will add up very quickly. For example, a typical music band from a visa country touring Canada with five musicians, a sound technician and a tour manager would need to pay a visa processing fee of CAD$100 and a biometrics processing fee of CAD$85 for each musician and crew member. This represents a total bill of CAD$1295, and no one has even boarded a plane yet. These fees will be passed on to Canadian festivals and performing arts presenters and they will considerably reduce the financial viability of foreign tours to Canada. Follow-up with the artists one month after contract signature to enquire about the status of the visa applications. Moreover, in order to amortize the increased cumulative processing fees, presenters should continue to collaborate with their peers, either as part of a formal block-booking process or as part of informal coordination discussions, in order to add as many dates as possible to tours originating from visa countries. To verify if visas are required in a given country, consult the list of visa-exempt and visa-required countries on the website of Immigration, Refugees and Citizenship Canada. CAPACOA is collaborating with the Canadian Arts Coalition and the Performing Arts Alliance to bring these issues to the attention of Canadian authorities. Among other things, a brief was submitted to the Senate Standing Committee on Foreign Affairs and International Trade, as part of their Study on the impact and utilization of Canadian culture and arts in Canadian foreign policy and diplomacy.